The picture of PhonerLite interface is not correct. Cound You please update it, Checker? Ah, I keep coming back to this one. I use a Jabra GN9350. This is the only softphone where I can answer and end calls using the power-button on the headset. On Windows 7 it has a few issues where you can't hear the other person, however. The authour is a German fellow in Germany, and I suppose it is hard for him to debug. If you post in his forum he will answer you. I have tried a lot of free softphones. Although there are some things I don't like about this one, I think it is the best, most-fully-featured of them all. There are no "pay later" limitations (which I understand, but don't like). You can transfer calls, you get a voicemail-checker, and if you visit the forum, Mr. Sommerfeldt will answer every one of your posts. He's not always sympathetic, but you'll never be ignored. I have been using this program for about 3 years now, and I do a lot of tech support. I would definitely recommend it. nice... a great alternative to commercial products like eyeBeam. this must be the only portable SIP phone available! could use a sound when typing in numbers in the program, but other than that, a great app! If you just need a simple, easy, solid SIP client this is it. 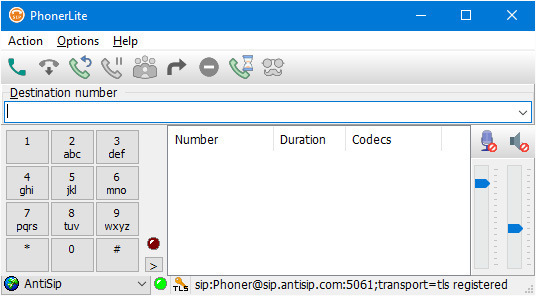 I tried many SIP-client applications for 2 years I use SIP-telephony. I am certain: this is No. 1 in quality ! Nice and small application - clearly laid out interface - nice forum-support. I started to use it a few days ago and it works perfect. "PhoneLite.exe has generated errors and will be closed... blabla"